Stanbi Peek – This outstanding peek is as versatile as it is imperceptible. Bizau also provides methods for peeking at multiple cards, and an application that has a surprise ending…with four Aces. Waterfall Peek – This is a method for cleanly peeking at a selection from the middle of the deck while performing a waterfall flourish. Spring Peek – Biz peeks at a selected card while performing a spring flourish, from the thumb. This is a very disarming, handy peek. Farophobia – Bizau tortures a card that is deathly afraid of being faro-shuffled. He inserts a card in the deck and upon performing a faro shuffle, the victim card shoots out, unexpectedly, from the deck. It’s weird, and way cool. 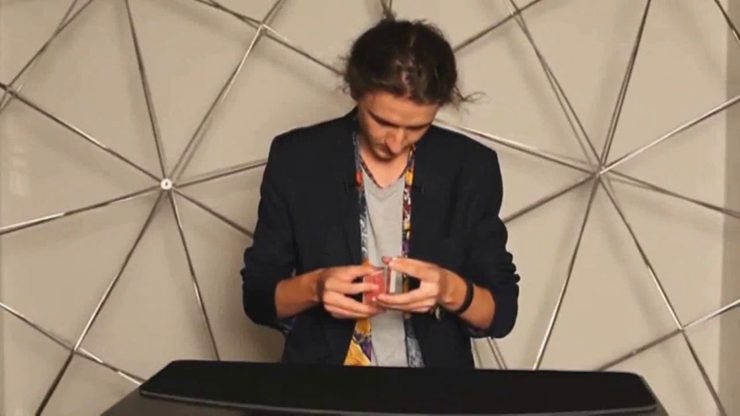 Heath – An impromptu method of freezing the deck while performing a Bridge Shuffle. Bizau provides methods for stopping at multiple cards as well as two productions. Mary/Ioana Color Change – With a wave of his hand over the deck, Biz changes the top card. Inside the DVD you will find methods for changing a card once, twice (back and forth), and multiple times in a row, as well as an application for each method of performing the change. Phantom Card – Biz throws a card into the deck to find a selected card. Multiple methods are shared, ranging from easy to difficult. Magician’s Tie – Stealing, vanishing, color-changing, or producing a card from the deck, all with the use of a simple necktie. After watching this you will never look at your tie the same way again.